Schweizer Orchards has been a continuous business in Amazonia, Missouri since the early 1900s. Conrad Frederick Schweizer was founder of the business. He purchased a forty acre farm north of St. Joseph and began raising apples, raspberries, and pears for the local market. Con then bought an eighty acre farm north of Amazonia where he planted apples, grapes, and berries and moved his family there about 1912. Con and his wife, Martha, had four sons, Pearl, Raymond, Ralph, and Calvin over a span of 21 years. All eventually worked in the family business including other enterprises. Farmland along the Missouri River bottom had been purchased over the years. They also owned and operated a service station in Amazonia. Each son was primarily involved with one of the enterprises, but everyone pitched in at harvest time. Apples had been planted and were producing on the original forty acres as well as the eighty acre property when, after an especially warm fall when the sap did not go down in the trees, a hard freeze came on November 11, 1940. It split the trunks on most of the trees, killing them. Subsequently, a 160 acre farm west of Savannah, Missouri was purchased and planted to apples by hand in 1941 and 1942. Since it took nearly eight years for the trees to come into profitable production, corn was planted between the rows for a few years. Following the retirement of Conrad Schweizer, the operation was under the direction of Pearl, Raymond, and Calvin. Two forty acre orchards near St. Joseph were leased for a number of years and then purchased around 1960. Pearl and Clavin eventually bought out Raymond when he wanted to retire., Later, in 1976, the operation was sold to Calvin's sons, Steve and Mark. In 1980 a new packing shed and larger cooler were built in Amazonia. This added the capability of washing, waxing, sizing, and packaging apples into bushels, tray packs, and poly bags all at the same time. 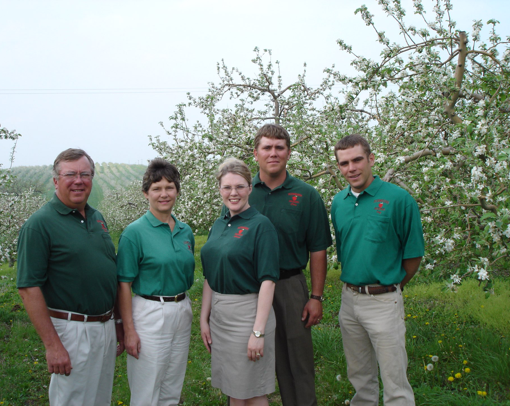 Steve and his wife Becky, along with their sons, Cory and wife Allison, and Nick, now operate the orchards, farm land, and a market and U-Pick orchard on the southeast corner of St. Joseph. This orchard was purchased in 1988 and consists of 86 acres. It has U-Pick blackberries, raspberries, blueberries, peaches, apples, and pumpkins. Vast varieties of vegetables are grown on the property and are sold locally during the growing season. Many field trips and parties are held at the orchard. 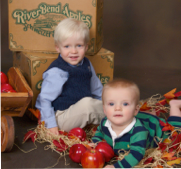 In the fall the hayrides to the apple trees and pumpkin patch bring people from far and near. In 2000 a Christmas tree farm was leased. It now consists of a choose and cut operation with hayrides out to the fields on weekends. Wreaths, grave mounds, and other fresh decorations are made and sold during this time. In 2009, this side of the operation was moved to the U-Pick orchard in St. Joseph. This operation added to the diversity of businesses Schweizer Orchards, C.F. Schweizer and Sons, Inc. are operating at this time.